Brussel sprouts are one of those veggies that it is so easy to hate on. I love brussel sprouts and even I do it. When teasing Jax about yucky food it is usually a toss-up whether I say liver and onions or brussel sprouts. Honestly, I can't say I've ever even had liver and onions. So I may love that too. What I do know is when Jax tried these, he was quite surprised that he likes brussel sprouts. Now it won't be nearly as fun to tease him! We grew some in our garden last year and they actually turned out better than expected. It is funny to see all those little balls growing up the stalk. Most of them stayed much smaller than what you find at the grocery store, with only a dozen or two of the larger ones. But the small ones were delicious too. We anxiously awaited the frost last fall so that we could harvest some sprouts! We really enjoy oven roasted brussel sprouts as well. Just halved and tossed with some olive oil, salt and pepper. They get that little bit of char and have such a great texture. Yum! But bacon makes everything better. Am I right? So, these pan roasted brussel sprouts take the cake as our favorite. Occasionally I drizzle a bit of balsalmic or something on them to change the flavor, but really we like it this way best! In large skillet, cook bacon until crisp. Remove from pan, roughly chop and set aside. Cook the onion and brussel sprouts for about 10 in the bacon grease over medium-high heat. Stir occasionally, but you want to let them take on some color. Once the brussel sprouts are cooked through (they should still have some texture, but not feel like you are chewing raw cabbage). Season with salt and pepper and stir in chopped bacon. See, this is how I need them fixed!! I think I may have to try them now that i see how you made these! Oh I can smell the bacon now and my husband will be so happy I made him Brussel sprouts. Winner! They are so good this way! If you have only ever had them steamed, boiled or microwaved you definitely need to give it a try. It isn't even close to the same thing! I haven't had brussel sprouts in ages and yes, bacon makes them better! It makes most things better, but especially brussel sprouts! Isn't it funny how different they are when they aren't all wet and mushy?! I hope you both love them! You really have to try them this way before you write them off! Mmmmmm! I bet they are fabulous with the bacon. I'm so jealous that your son will eat brussel sprouts. Mine is SO picky! 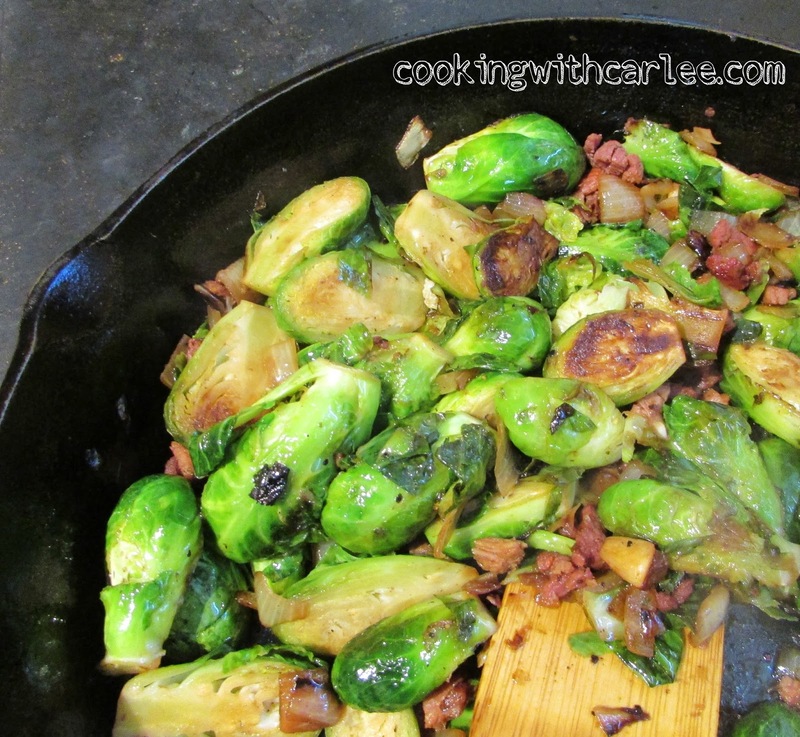 This is a great way to make Brussels sprouts! Thanks for sharing the recipe at Cooking and Crafting with J&J! It is my favorite way, though I really want to do a shaved brussel sprout salad sometime too! Thanks for hosting! We try brussel sprouts once a year, and just haven't found the love of them yet. I think I need to try them your way before I totally give up! I hope you try them and love them! This is by far our favorite way to eat them. I agree, I hope you love it! Hi Carlee, this is such a classic dish! I love brussel sprouts although I don't have them often because my husband isn't a fan. I'm going to have to bring them back to the menu. #Waywow. You should! My husband turned his nose at them the first time I said I would make them for him, but now he loves them! These look amazing!! I love with they are pan roasted...especially with bacon! Thanks for sharing on My 2 favorite Things on Thursday! See you again tomorrow!! Pinned! Mmmmmm.... This looks and sounds amazing! Definitely pinning this! Thank you for linking up with us at the Tips and Tricks Link Party! Cannot wait to see what you have for us next week! Thank you. This is by far our favorite way to have brussel sprouts. Thanks for hosting! 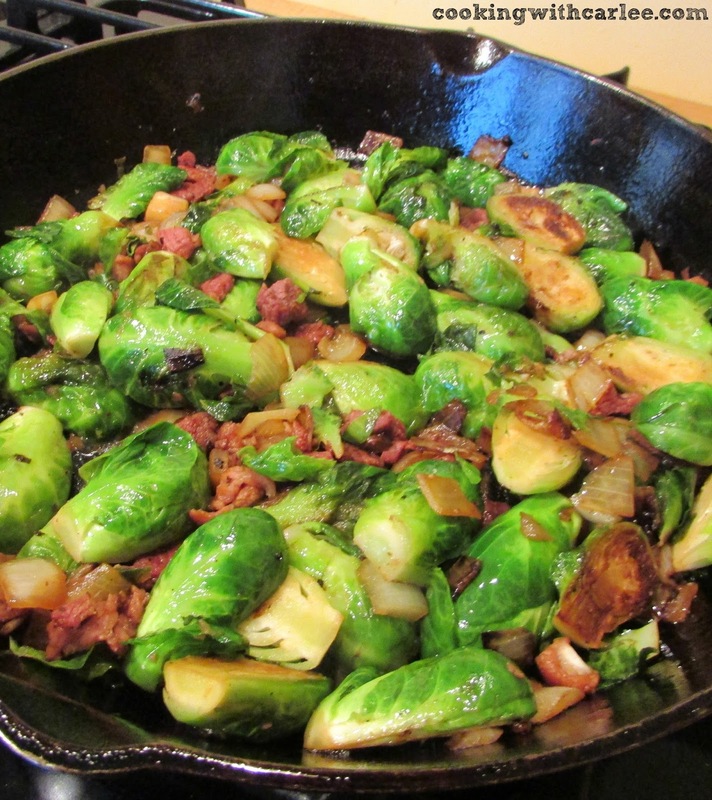 Your Pan Roasted Brussel Sprouts look delicious! Thanks so much for sharing with us at Full Plate Thursday. Have a great weekend and come back soon! On Easter I took a mix of roasted veggies to my parents home, it included brussel sprouts, which my mom did not think she liked. Not until she tried them this way, she loved them! I didn't put bacon in ours as I was using the veggies to fill in for my daughter's vegetarian diet, but my husband and I are going to add it to ours! Thanks! 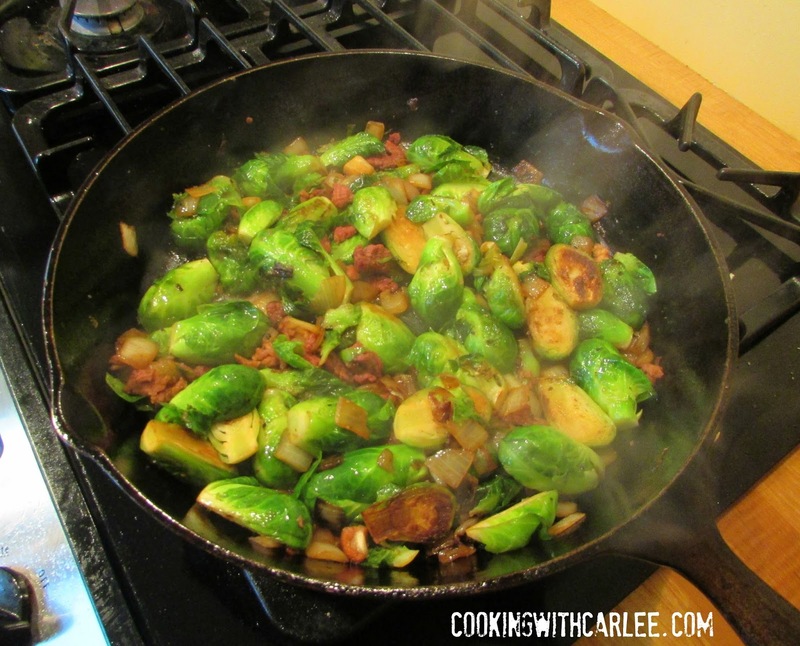 I'm not a big brussel sprouts fan, but maybe I need to try them with bacon ;) Thanks for linking up with Merry Monday! Please do! They are so good this way! Thanks for stopping by! I love roasted brussels! One of my favorite side ;).